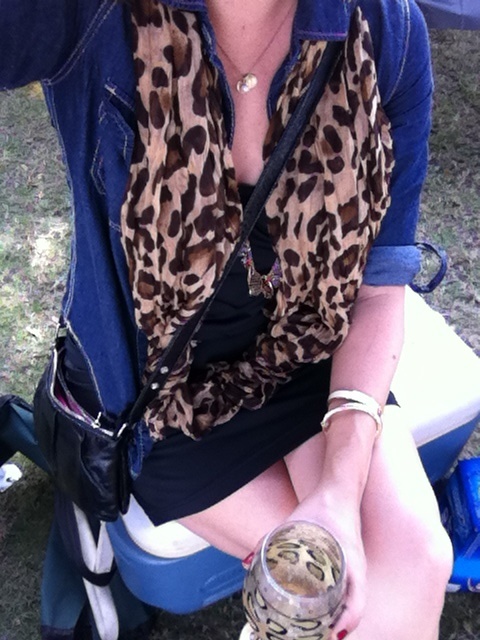 I styled today's tailgate look with my basic black dress, dark denim shirt, black booties, and a light-weight leopard scarf. Since I'm such a minimalist (cough*) I decked out my wrists in as many bracelets "felt right." I also wore two more on my other wrist (above photo), rings, and two necklaces. As UCF was risking losing the game, and my husband was holding me tight, I had a moment of feeling grateful for his true minimalism. As cheesy cheeseburger as it sounds, we balance one another and he is my best accessory (with this fact set, I'll still bury myself in bangles!). It was a cool moment for me as we sat in the stands and enjoyed the rest of the game together.